The researchers of the Flextension A-Gear project are working on the development of a new arm support for over 1.5 years now. A lot of research has been done and the development of a first passive prototype (without electromotors) is finished. This prototype is extensively tested in healthy subject and in boys with Duchenne. The first results were positive. 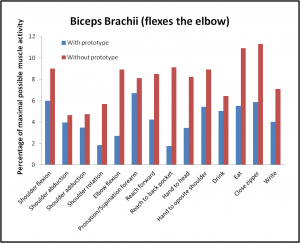 The range of motion of boys with Duchenne increased and the indicated to be less fatigued when using the arm support. However there were some points of improvement. That’s why we are designing and assembling a second prototype, which will be tested extensively as well. 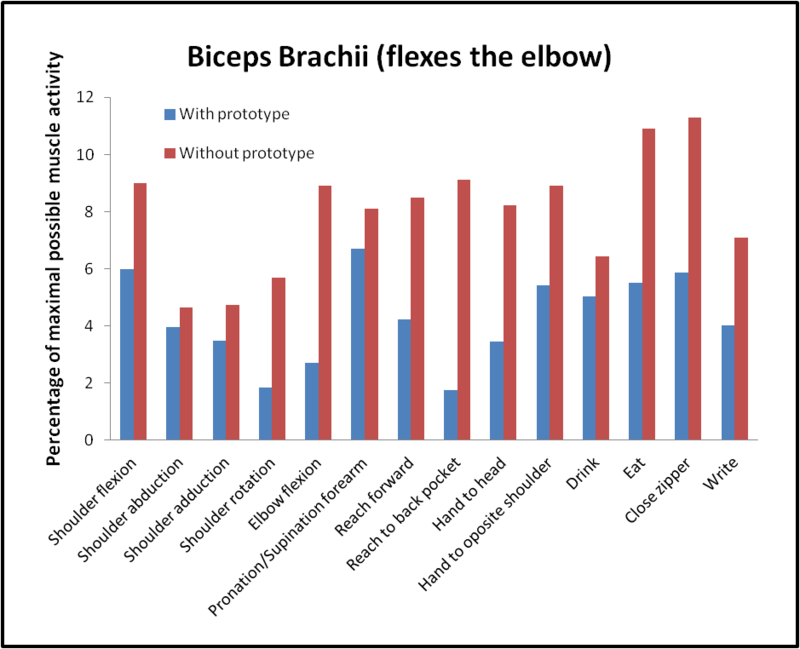 The figure shows the effect of wearing the first prototype on the amount of muscle activation of the Biceps Brachii (the muscle that flexes the elbow) during the performance of activities in a healthy subject. As you can see, less muscle activity was needed when the subject was wearing the prototype, which probably means that activities need less energy. Are you interested in testing one of the prototypes or to participate in another study concerning arm function in boys with Duchenne, please contact Mariska Janssen (T: 024-3668195, E: mm.janssen@reval.umcn.nl).